On the left: Martin Baxendale, Green candidate for Valley ward in the coming by-election. In the middle: Nadine Smykatz-Kloss who gave vital evidence at the recent Baxter's Field public inquiry. 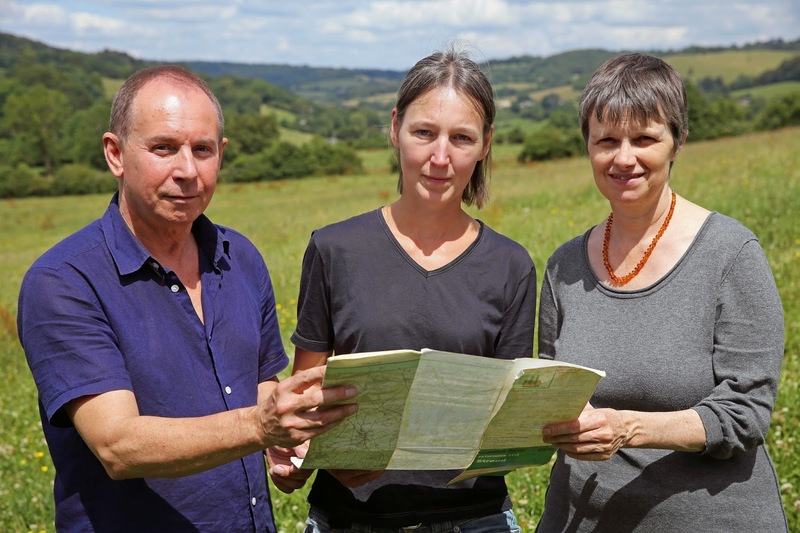 On the right: Molly Scott Cato, Green MEP for the south west and former representative of Valley on Stroud District Council. This is the view up towards Slad from Baxter's field, a reminder of how beautiful and precious our landscape is. Molly fought passionately to defend this landscape for many years. Now, on the European Parliament's committee for agriculture and rural development, she may be able to influence the laws that shape how our countryside is managed. Martin is dedicated to defending these fields, in any way that he can. The Green Party believes in long term thinking, not short term profits for the few. We see more value in a landscape than short term development and the extraction of 'resources'. We see homes and communities, landscapes people love, we see history and tradition, culture and inspiration. We see biodiversity and quality of life. This view, and this landscape are irreplaceable.